Sometimes, it’s the most unlikely of pairings that end up having the most impact. And in the world of comedy, it’s often the seemingly unsuited duos who audiences find they relate to. Morecambe and Wise, Reeves and Mortimer, Walliams and Lucas – all pairings that feature two men who really don’t seem the type that would gel, and yet who do so naturally. In the case of the Mighty Boosh however, this sense of ‘the odd couple’ is one that at first seems so obvious – and yet quickly disappears as soon as your attention is taken from the two men’s differing appearances to the their love for off-beat comedy and their uncanny ability to rustle up ideas in the time it takes some writers to draft just one line. 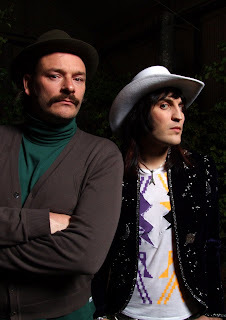 In the Mighty Boosh, Julian Barratt (aged 40) plays Howard Moon, a jazz-obsessed sensitive soul with a science teacher’s dress sense and the fragile heart of a poet. His foil is Noel Fielding’s (aged 35) Vince Noir, an easily swayed wannabe rockstar who deep down loves his housemate Moon – but treats him like the brother who’s to uncool to have around. At the heart of the show is the relationship between the two men – and their curious adventures to the likes of Planet Xooberon, the Mirror World, and the (literally) rubbish home of the Crack Fox. Noir and Moon inhabit a world that’s not quite in the same dimension as ours – it’s a world where urban foxes become addicted to illicit substances, where a shaman called Naboo (played by Noel’s brother Mike Fielding) and his familiar, an ape called Bollo (played by longtime friend Dave Brown), share a house with the protagonists, where a crazed zoo owner wreaks havoc wherever he goes (the inimitable Rich Fulcher as Bob Fossil), and where anything is possible as long as it’s within the realms of imagination. The Mighty Boosh has taken many forms – it was a live show first, going from small pubs to the Edinburgh Festival in a short space of time; then it went from a being an award-winning production to a radio show; its next incarnation was as a TV show on BBC3. That show, also titled The Mighty Boosh, has had three series and paved the way for a new incarnation of the Boosh live on stage. Now on their second tour post-TV series, Fielding and Barratt, along with the huge crew of friends that makes up the family behind the show, will be bringing the Boosh to Ireland for the first time. If the last tour, which took place in 2006, is anything to go by, expect plenty of fans in costume, dressed up as everything from rogue jazz cells to hermaphrodite sea creatures. The fans are what have made the Boosh as successful as it is today, going from a cult TV show to a surprising, but deserving, mainstream hit. And it appears that no one is more surprised than its stars. The live show will contain “up to 30 or 40 per cent music”, which comes as no surprise as the show has featured a large number of wonderfully off-kilter songs written by Fielding and Barratt, the latter of whom is a consummate musician in his own right (similarly, Fielding’s talent for art led to his sketches becoming the basis for the look of all of the characters). In fact, there was even a Mighty Boosh festival at Hop Farm in Kent last July, at which the Boosh Band performed – which goes some way to demonstrate the current popularity of the show. With their rather unique imaginations and ability to come up with characters, scenarios and plotlines that can charm, bemuse and astonish audiences, it’s clear that the Mighty Boosh will exist, even if in a number of different forms, for many years in the future. Somehow, it’s hard to imagine that day will ever cme.